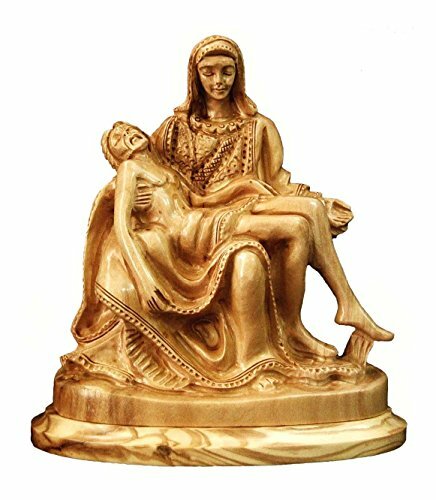 Bethlehem Olive wood Pieta sculpture. The Pietà is a subject in Christian art depicting the Virgin Mary cradling the dead body of Jesus. The Pietà is a subject in Christian art depicting the Virgin Mary cradling the dead body of Jesus, most often found in sculpture. As such, it is a particular form of the Lamentation of Christ, a scene from the Passion of Christ found in cycles of the Life of Christ. When Christ and the Virgin are surrounded by other figures from the New Testament. Bethlehem Olive wood sculptures and figurines. For over 300 years, Bethlehem Artisans have carved religious figurines from Bethlehem olive wood that are inspired by the Gospels. If you have any questions about this product by Bethlehem Casting, contact us by completing and submitting the form below. If you are looking for a specif part number, please include it with your message. Lighthouse Christian Products Moments of Faith XL Humble Servant Sculpture, 14 x 10 1/2 x 11"